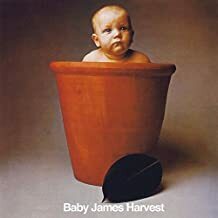 Barclay James Harvest (continued) – One last album came out in 1972 on the Harvest label (which without their namesake folded a couple of years later too) – Baby James Harvest. Although the songs themselves are pretty good, the band sound a bit tired, directionless maybe; it could well be that these were largely left-overs from earlier albums re-recorded for the contractual obligations to Harvest. I still like the record mind you, but before that a couple of singles emerged credited to Bombadil, but which were actually the band. The full story for the name deception is not clear, but it must be something to do with trying to escape their record contract. These and other singles and b sides are included as bonus tracks on this album. The album itself is quite different from the first three. There is one long classical piece, where Wolly (who wrote it) sings with just an orchestra. The song is ‘Moonwater’ and though quite beautiful seems from a different era entirely. The best song is probably ‘Summer Soldier’, another John Lees composition; this is about as close to ‘Political’ as the band got and echoes Buffy’s song ‘Universal Soldier’. But the band were already dividing up their albums by different songwriters. John Lees being in my opinion the best, but Les Holroyd has three songs on an only 6 (but long ones) song album. These tend to be more ‘poppy’ somehow, less orchestral, less melodic to my ears. Maybe just the constant touring and recording had taken their toll and this album was rushed out. Still. Two years until their next record. New management, new record label (Polydor) and new sound. They wisely dropped the orchestra and concentrated on a style they could reproduce live. They had made four albums, which were selling steadily, and they were constantly playing live – and they were broke – so time for a re-think. The new sound was a bit more dynamic, a bit heavier, and yet they still managed to retain their gentler moments and the complex structures of the songs which would climax and have quieter sections and build again – all in the same song. They burst back with a new album Everyone is Everybody Else. This was a bit more ‘political too, with a great new Woolly song ‘The Great 1974 Mining Disaster, which lamented the poor miners struggle. Also, the title is taken from the final song ‘For No One’ which has that line in it. A sort of hang-back to hippy ideals. But the best song was another John Lees composition ‘Child of the Universe’, celebrating the fact that we are all ‘international and connected and one, a lovely melody too, And there isn’t a poor song on the whole album, so, a great comeback, and the album sold better too. They also released the first of several live albums, and this first one (a double) sold well too.